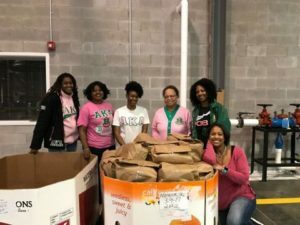 A lpha Kappa Alpha’s Family Strengthening Programs targets critical issues facing many families, including lack of food, shelter and financial means. In support of the sorority’s Childhood Hunger Initiatives, GUO partners with the Virginia Peninsula Food Bank, the leading hunger relief organization across the Greater Peninsula. We have provided canned goods and non-perishable foods, financial support and hands-on assistance in the warehouse on numerous occasions throughout the years. Members of Gamma Upsilon Omega Chapter volunteered at the Annual S.E.E.D.S Family and Community Resource Fair. GUO registered families, as well as helped prepare and serve lunch. The Resource Fair is for families of currently enrolled students in Hampton City Schools. Parents learn about educational resources, local organizations, and other resources/services available to families in Hampton. Attendees receive lunch & school supplies! Coats, blankets, gloves and sweaters were collectd and donated to Transitions as a part of the sorority’s Family Season Wraps Program. In addition, we’ve supplied the organization with 20 purses filled with toiletries and toys and clothes to children and adults receiving assistance. Transitions Family Violence Services is a nonprofit 501 (c) 3 organization founded in 1977. They are the sole provider of comprehensive family violence services in Hampton, Newport News, and Poquoson, and a co-provider of services in York County. As part of the Fiscal Responsibility Program, GUO partnered with representatives from Golston Real Estate, OVM Financial, and Wells Fargo to host a Home Buying and Budgeting Seminar. A wealth of information was shared to help attendees better understand the home buying process, budgeting and financial management.